Shade came from a repeat of the breeding that brought us her brother, Bolt. She had a pretty expression, nice outline, excellent angulation, great front and outstanding movement. She truly had the fluid tireless gait of this sturdy breed's working heritage. 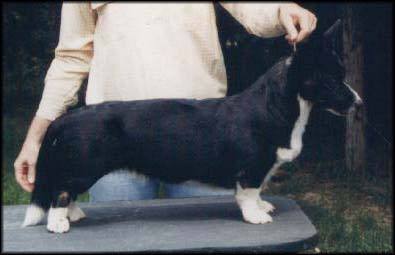 During her show career she won several points towards her AKC champion title and was only a few points short of her UKC champion title when she was retired from the ring. 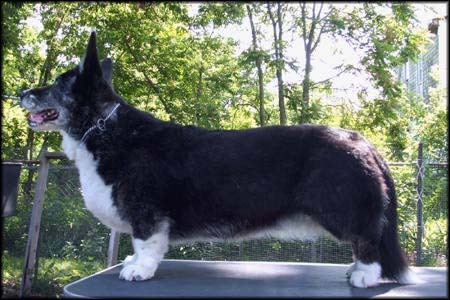 Shade produced two litters for Wyntr. 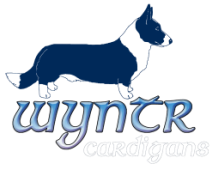 The first, Wyntr's "A" litter, was sired by Coedwig's Laser in '99 which gave us our Rah Rah and the second, Wyntr's "B" litter, was sired by Cornerstone's Dreamer in 2002, which gave us Beautiful and Bastion. Shade was a fantastic mother and like her brother Bolt, she produced all of her best qualities. She was learning agility after her retirement from conformation, but never competed due to a fractured toe after catching her foot on a pavement crack. She reigned as the matron Queen Mother of the Wyntr household until we lost her to hemangiosarcoma in 2009 at age 12. Until we meet again, sweet girl. Shade was a half-brother to #1 ranked cardigan, AM CH Coedwig's Carbon Blue ROMg. Many thanks to Kim Shira at Coedwig for letting us found our line with this wonderful girl!